Nîmes, l'Antiquité au présent is part of the Tentative list of France in order to qualify for inclusion in the World Heritage List. My visit to the TWHS of Nîmes seemed like such a simple plan: fly to Marseille and then drive there in an hour. In Nîmes I then would have an afternoon to see the Roman monuments. But reaching the city this particular last Saturday was hindered by people in 'yellow vests', protesting against the high fuel prices and other issues. All access roads but one had been blocked, so with a huge U-turn (which cost me over an hour extra) I had to enter the city from the north. Even there it was a slow affair. Fortunately all protests that I came across in the south of France went peacefully; I got a free passage twice on the toll roads and a banana in return for the discomfort. In Nîmes itself, the Musée de la Romanité was my first destination. This is a grand Roman museum that has opened this summer to reinforce the WH candidacy. For 17 EUR I got a combi-ticket that also gave access to the 3 most important Roman monuments of the city: the amphitheatre, the Magne tower and the Maison Carrée. The museum interior is modern and light. Nice to walk through, but the collection itself I found not that special. Nîmes seems to feel the need to measure itself with the neighbouring cities of Orange and Arles, which are already WHS because of their Roman history. However, ‘Nemausus’ was only one of the many colonies founded by the Romans in foreign lands, in this case an area inhabited by Gauls. The question where it distinguished itself from the others remains unanswered at the museum as well. The museum can even become an obstacle for WH inscription: ICOMOS found that the visual integrity of the amphitheatre is spoiled by Musee de Romanité. That may be a bit harsh, but it is remarkable how close the two are to each other. The museum has a panoramic terrace which actually is too close and too low to have a good view of the amphitheatre. The oval amphitheatre nowadays is mainly used for bullfights. In Roman times it was a gladiator arena, something that is still remembered by cardboard information panels and a single tiny exhibition room. It mostly reminded me of an outdated football stadium, with many entries and chilly passageways. The most beautiful building in the city center undoubtedly is the Maison Carrée , a perfect Roman temple. You can go inside - it has been transformed into a cinema. Every half hour a film about the Roman history of the city is shown. 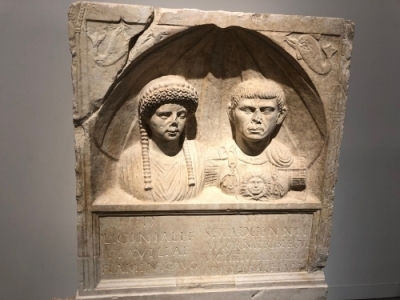 The main characters of this story are Licinia Flavilla and Sextus Adgennius Macrinus: the two whose heads adorn the most beautiful tomb in the museum (see photo 1 above). Finally I walked on to the Gardens of the Fountain. In a corner of this park, one of the first French city parks, lies another Roman monument: the Temple of Diana. This was probably not a temple at all (a library perhaps? ), and certainly not dedicated to the goddess Diana. What now remains is a ruin in a fragile state, partly flooded with water. The decision to add the Historic Urban Ensemble of Nîmes to the World Heritage List was deferred earlier this year. ICOMOS doubted whether Nîmes is “sufficiently distinguishable from other cities with similar Roman roots” – or at least did not see it proven in the comparative analysis. But it recommended to focus on that Roman heritage angle anyway for a future renomination, as a wider scope including Renaissance, Neoclassical and modern structures would have even less chance of success. I found Nîmes unmistakably French, with grand squares and classicist buildings: pretty pleasant but also nothing special. The amphitheatre and Maison Carrée may be excellent preserved monuments from Roman times, but they did not move me in any way: they are too much connected to mediocre tourist traps. 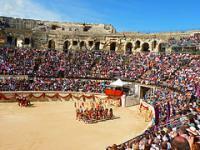 I visited Nimes in April 2012. I went shortly after Arles and I must say that I very much preferred Nimes overall! There was a reenactment when I was there and the Roman arena was packed and really impressive. The view from the Tour Magne was quite worth it too. I decided to stay overnight and I wasn't disappointed. Should I be in the vicinity, I would gladly revisit Nimes over Arles anytime. Nîmes is a very recent entry to the French T-list, thus one can assume that there are plans for a nomination within the next years. Nîmes is also part of the T-list site “Les villes antiques de la Narbonnaise et leur territoire”, but there is probably little confidence in a proposal that only includes the Roman heritage. So the approach has been extended to the entire historic city centre with a medieval cathedral and buildings and mansions from the 16th to 19th century. 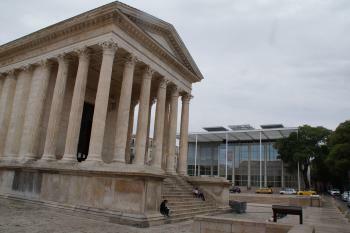 In the description on the WHC website Nîmes is referred to as an example of the influence of Roman architecture on urban planning and architecture of later epochs until today. Stylistic and decorative elements from the ancient times were also used in buildings of the later centuries. Undoubtedly, the Roman remains are the most important monuments in Nîmes. First the amphitheater: it is very similar to the Arena in Arles, but more complete and better preserved. Second the Maison Carrée: I was even more impressed by this well preserved Roman temple. The Corinthian columns correspond nicely with the modern Carré d'Arts by Norman Foster on the opposite side of the square (photo). The temple is completely preserved, due to the almost uninterrupted use as a church, later as meeting place for the senators, a barn during the French Revolution, an archive and finally a museum. Other Roman remains are the Temple of Diane and the Tour Magne (both in the Jardins de la Fontaine), the remains of the Roman city wall (Porte Auguste, Porte de France), and the Castellum, a circular tank and the endpoint of the Nîmes aquaduct. The narrow streets in the old town north of the Amphitheatre are also worth to explore. In the area around the Tour d'Horlange and the Cathedral are many mansions with wrought-iron balconies and adorned portals, most of them dating from the 17th to 19th Century. Where possible, you should have a look in the courtyards, some have beautiful staircases. However, I have some doubt that the concept of a stylistic relation between the Roman remains with later architecture is really convincing and that an inscription would be justified. Nevertheless, Nîmes is worth a detour, if you have some time left after visiting the four WHS in the region. It can easily be visited in a half day from Arles or Avignon.